What is our Business Portal? An exclusive online tool to monitor and improve your waste management performance and costs. Raymond Brown provides a bespoke waste management portal to achieve sustainable solutions for all of our customers. Our next generation cloud-based technology provides you with access to all of your waste data at anytime, giving you complete control over your waste management and the waste streams generated on each site. The portal gives you complete traceability of your waste to evidence the benefits achieved by recycling and to help your business save money. 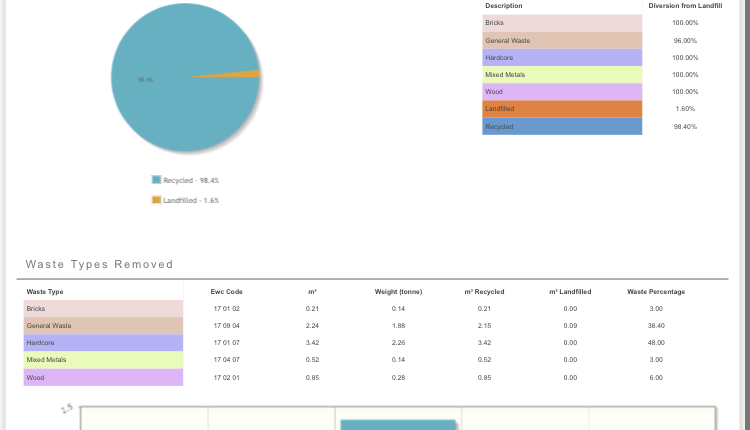 It provides you with the ability to create detailed reports, view invoices, download weights and see all your tickets. All of our drivers have handheld mobile devices which capture signatures, take photographs and record all required information to improve the accuracy of your waste segmentation analysis. All documentation can be sent electronically to any device and we will be able to update you via email on your driver’s progress at any stage of the service. We can also amend your own preferences on the stage of the operation you would like to be updated on. Access securely anywhere – Access the portal via computers, tablets or smart phones. Full site waste reporting – All information and reports can be downloaded and exported. Save money and time – The portal stores all invoices for you so you can view them at the click of a button. Environmentally friendly – All your waste data can be completely paperless. Complete traceability of your waste – Have full control over your waste management and the streams generated on your construction site. To sign up to our waste management portal, just call us on 01264 720257 or email us at skiporders@raymondbrown.co.uk.